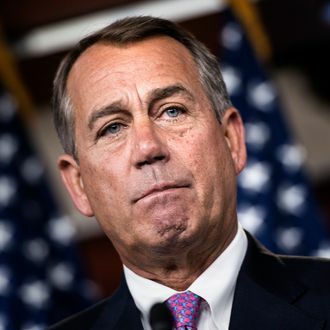 For once, House Speaker John Boehner’s obstinance might be working in President Obama’s favor. As Vladimir Putin looks for opportunities to belittle Obama at the G20, Russia followed through on a suggestion to send a delegation of their lawmakers to D.C. to persuade members of Congress to take a “balanced stance” on Syria (presumably one that doesn’t involve bombing their ally). Shortly after they officially asked for a meeting next week, Boehner’s spokesman announced on Wednesday that he “declined the Russian embassy’s request that he meet with a delegation.” Other members of Congress have yet to respond, but they probably won’t be much more receptive. The Syria issue is contentious enough without lawmakers opening themselves up to the suggestion that they were swayed by the Russians.